Friends, I cannot wait to show you this build! 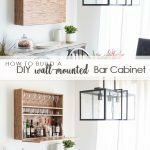 I’ve been wanting a wall-mounted bar cabinet for my dining room for quite awhile now. 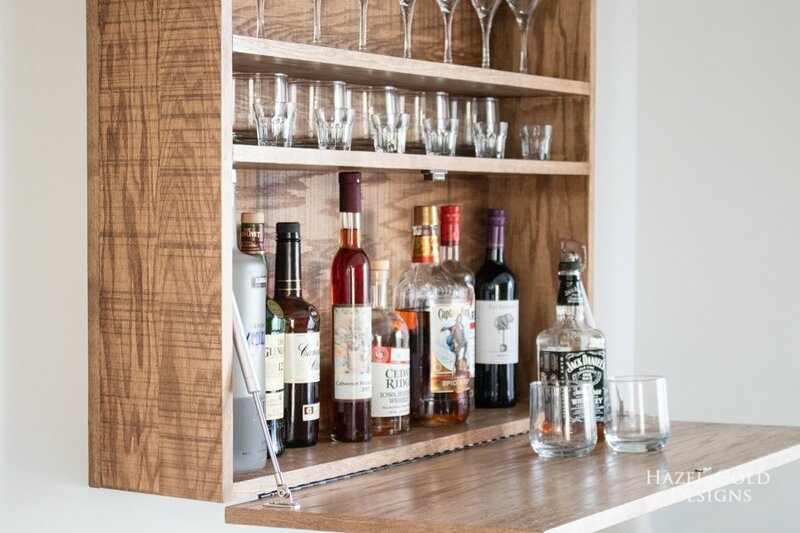 A place to keep the alcohol when we entertain guests that doesn’t show the entire collection day-to-day. I didn’t have any room for a standing cabinet so this was really my best option. This project is a collaboration with Jen Woodhouse and am absolutely thrilled with how it turned out. 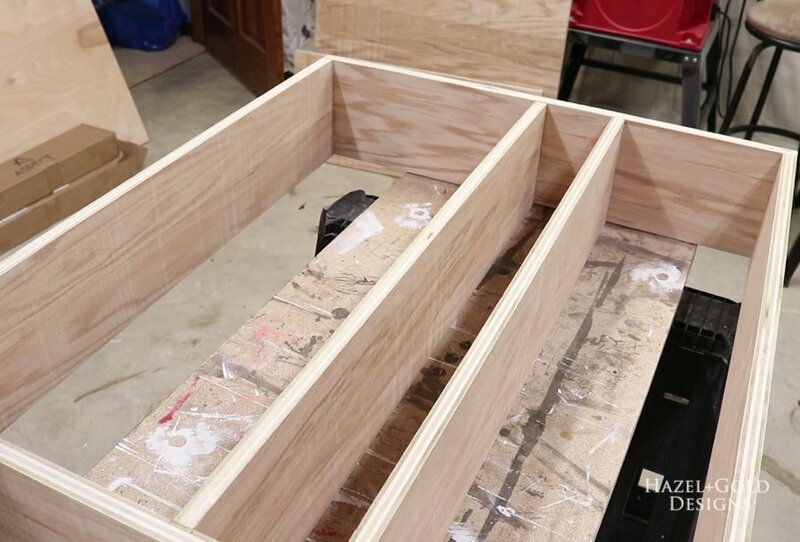 Jen wrote up the plans, which you can find HERE and I put together this build tutorial for you! I hope you love it! 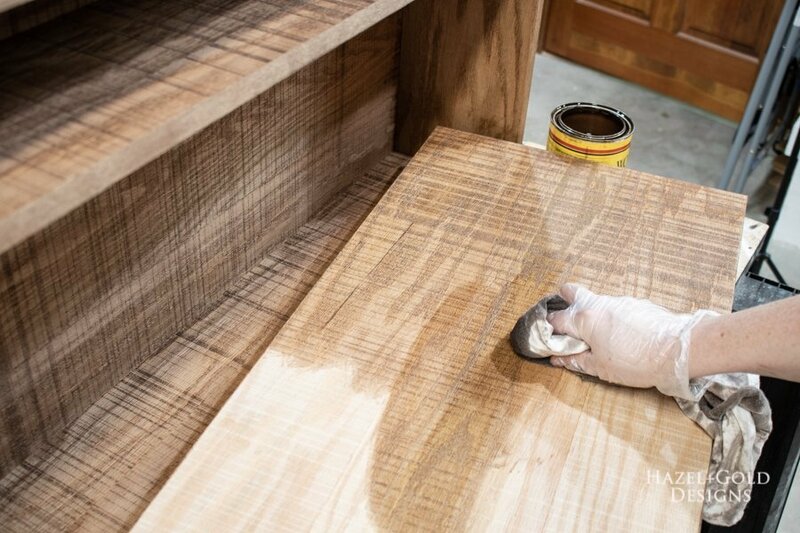 This post is sponsored by PureBond® Plywood. I strive to always be honest about the product when doing a sponsored post and all thoughts and opinions are mine. You can read more details on my Disclosures page. Also, please be sure to only use tools you are familiar with and to use all safety precautions! 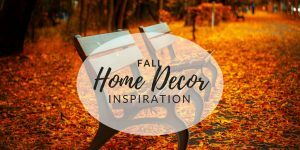 There are affiliate links in this post for your convenience, which simply means that if you order through those links I get a small commission at no extra cost to you. Thank you! First, download and print Jen’s plan (found HERE if you haven’t already). My PureBond® rough sawn plywood panels were 2’x4′ so I had to assemble two boards together in order to make one solid back (since it is larger than 2′.) I’ll go through that below, just wanted to mention right away. The 2’x4′ size was perfect for me to handle on my own. 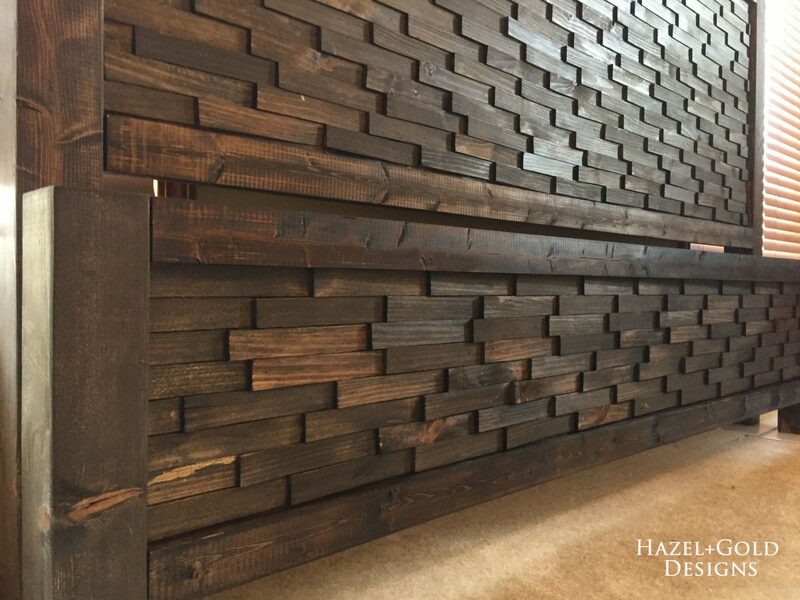 If you decide to try this awesome rough sawn style by PureBond® be sure to use the Ship to Store feature on the Home Depot website! It was quick and easy. I was contacted when my order arrived and made a quick run to Home Depot to pick it up. I’ll definitely be using that feature more in the future! 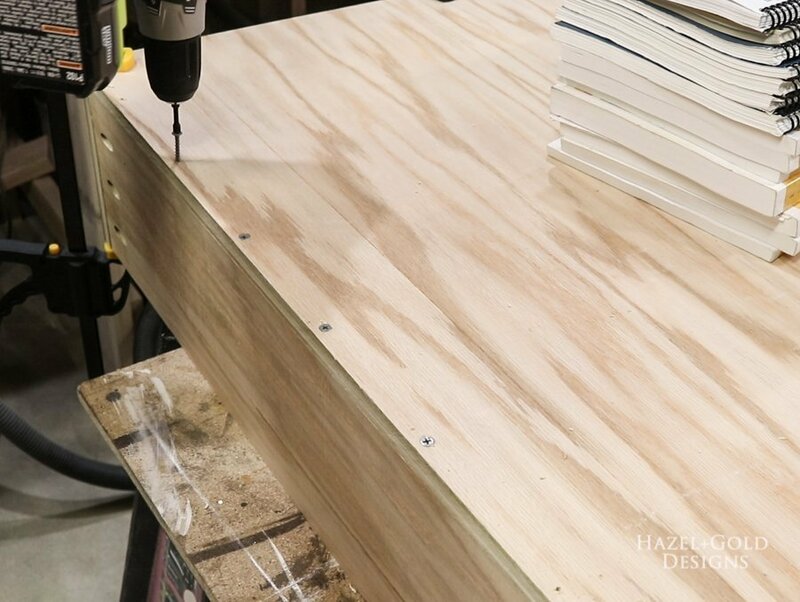 The first step is to cut the PureBond® plywood down according to the plan. I did this using a circular saw and guide, and a miter saw, because I desperately need to do some maintenance on my table saw. 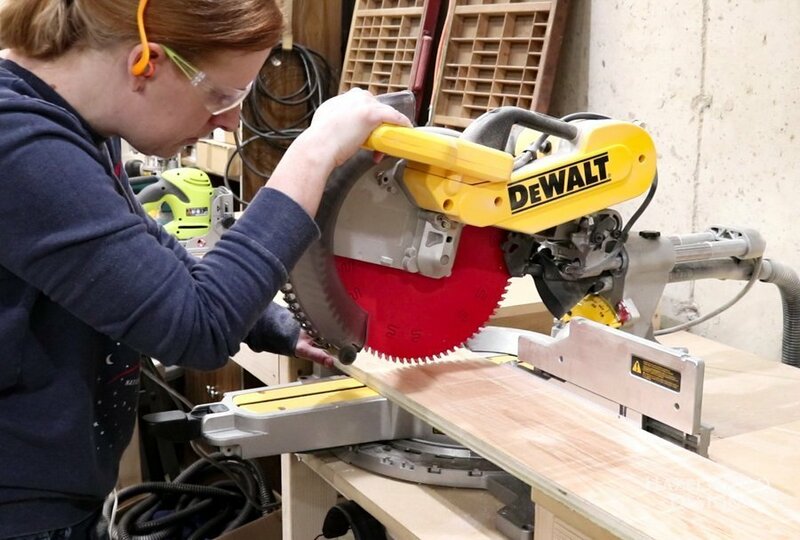 It would certainly be faster to use the table saw. 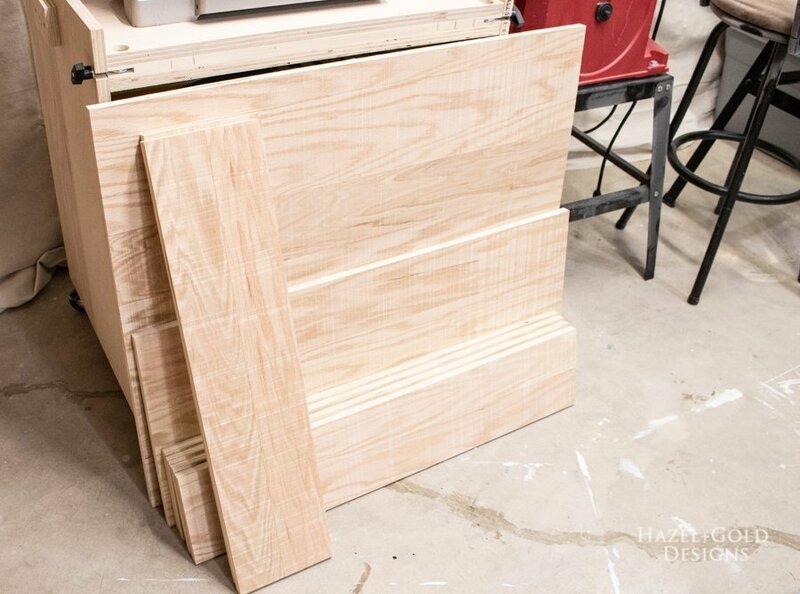 As I said before, because my plywood panels were smaller, I had to put two pieces together to make the large back piece to this cabinet. I did this using a biscuit joiner, #20 biscuits and wood glue. The biscuits help you to align it properly and also add some extra stability to the joint. 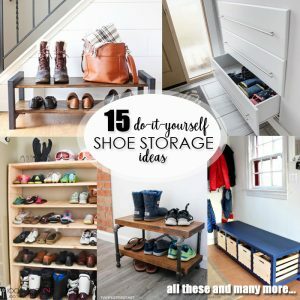 You could do this using dowels or some other method as well. Clamp the pieces together making sure they don’t lift from the table at all (I added some heavy books to the top) and give it a few hours to dry. I assembled the cabinet box while waiting. 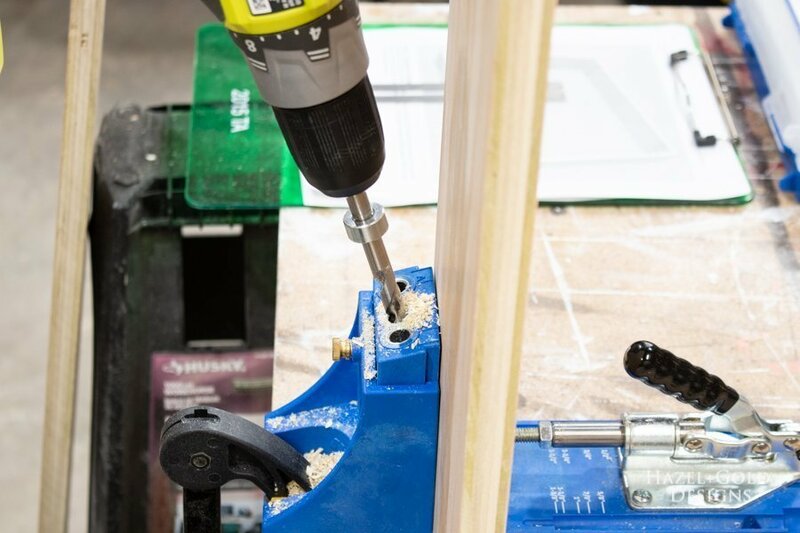 To create the box of the cabinet drill three pocket holes in each end of the top and bottom boards as shown in the plan. 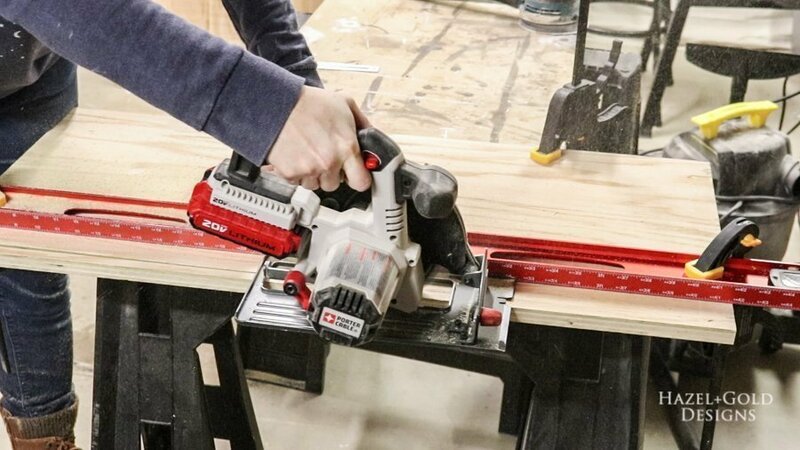 Be sure to drill on the smooth side of the rough sawn plywood! 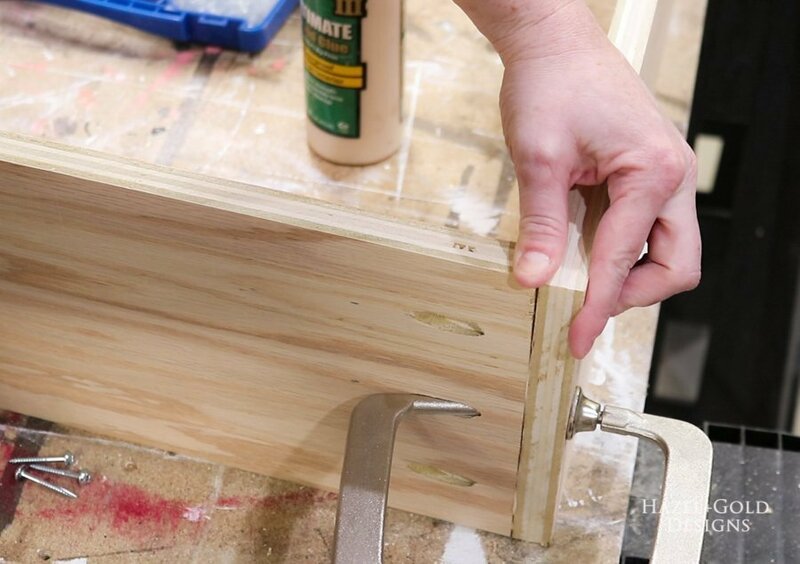 Assemble the box by clamping the top and bottom boards inside the side boards, applying glue and screwing in pocket screws. 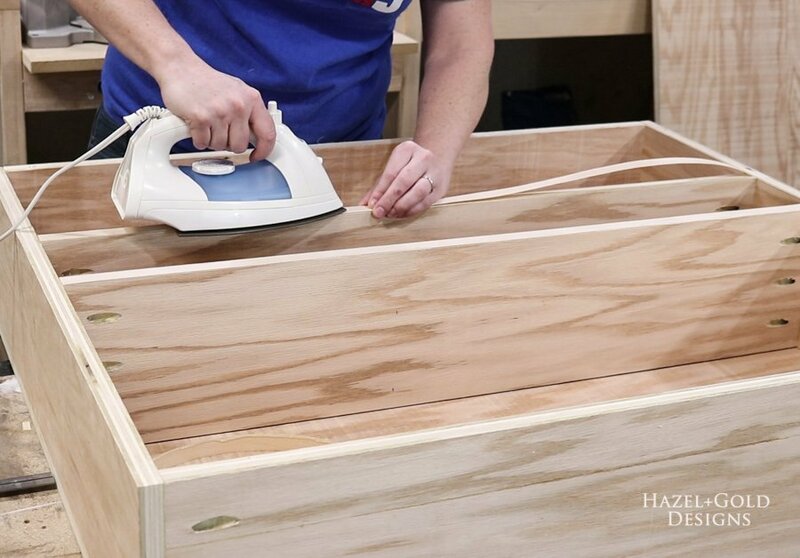 Measure inside your box and cut your shelves to size. Drill pocket holes on the plain side (not rough sawn side) and attach them in place. 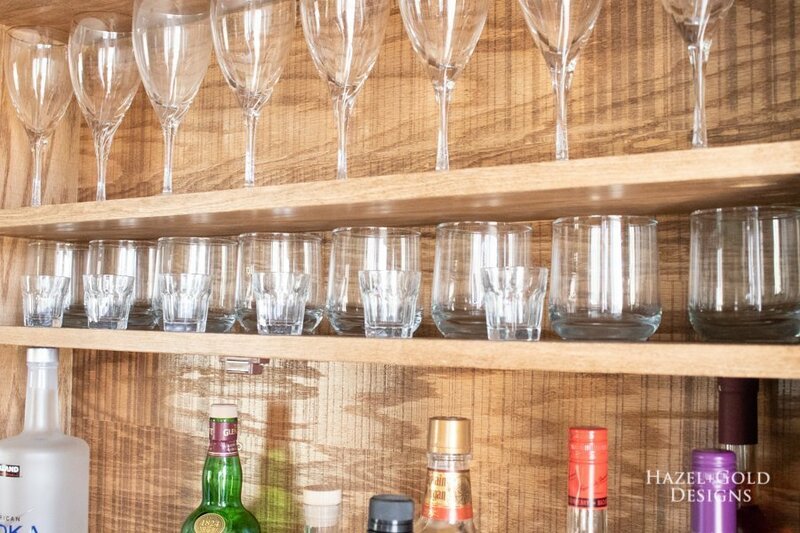 You are able to adjust where you place these shelves if your glasses are shorter or taller than mine were. Here is the box with shelves installed. 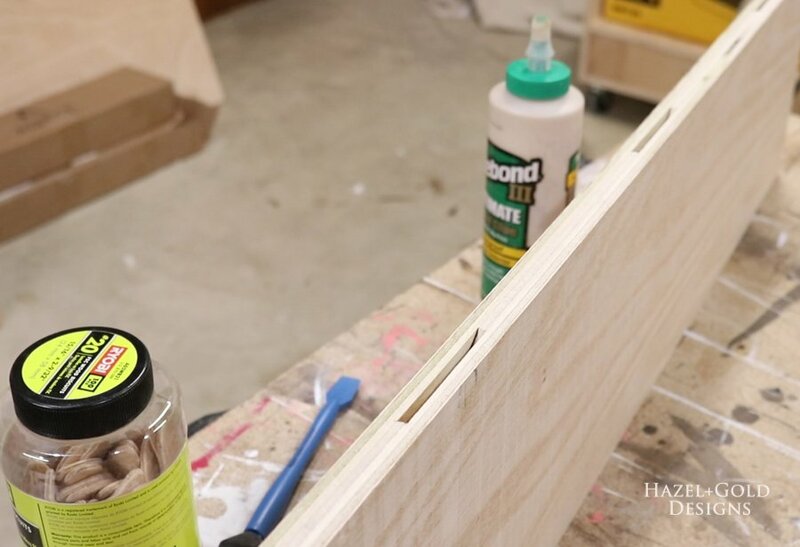 Add glue to the back side of the cabinet frame and carefully set the back in place. Remember you want the rough sawn part facing the shelves. Clamp in place. 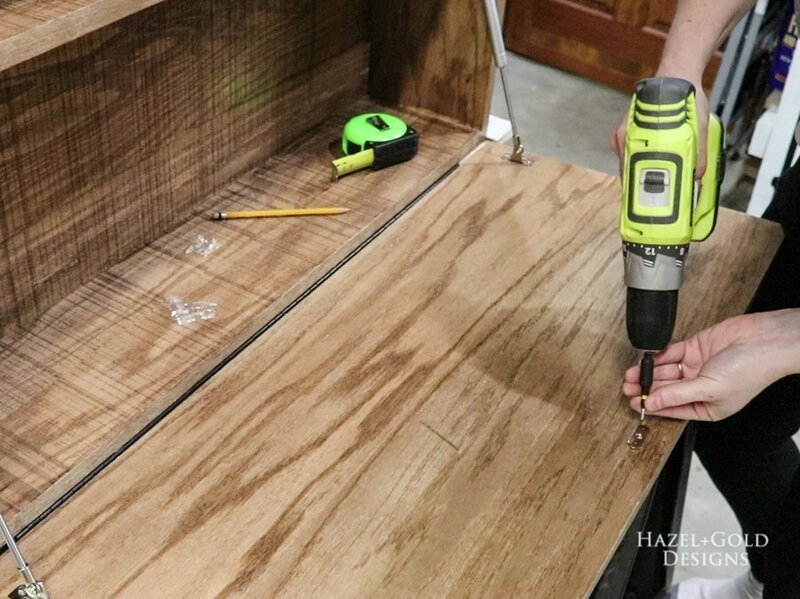 Drill pilot holes around the entire thing and use wood screws to secure the back to the cabinet frame. 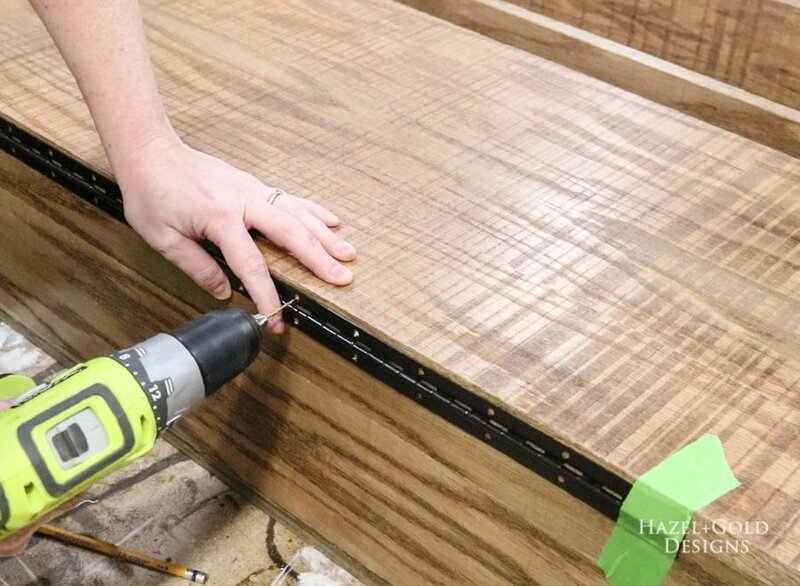 Use matching edge banding to finish off the plywood edges and make them look fantastic. 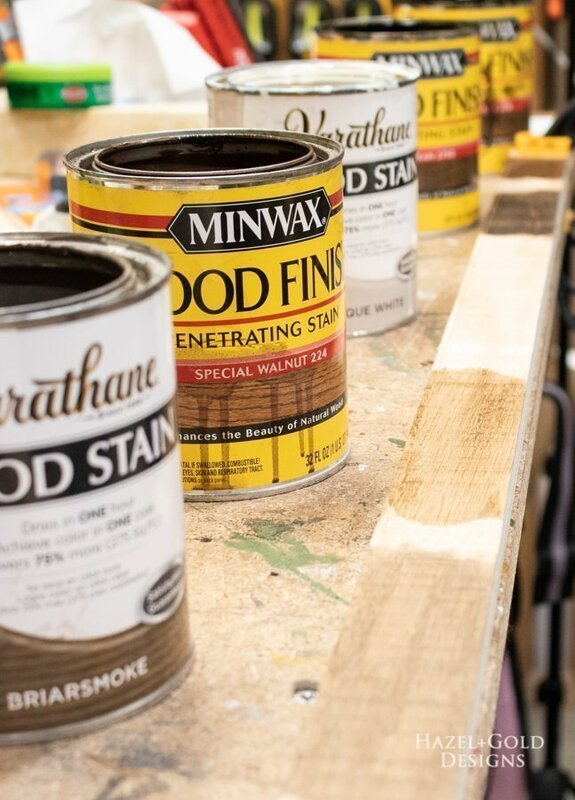 If you’re unsure of what stain to use, grab a piece of the plywood and make samples! I had never used this rough sawn plywood so I wasn’t sure which stain would look best, but it really looked amazing with all of the stains. I ended up loving the Special Walnut best to match the room where I was going to install this cabinet. For staining I almost always use a vinyl glove and old t-shirt rags. 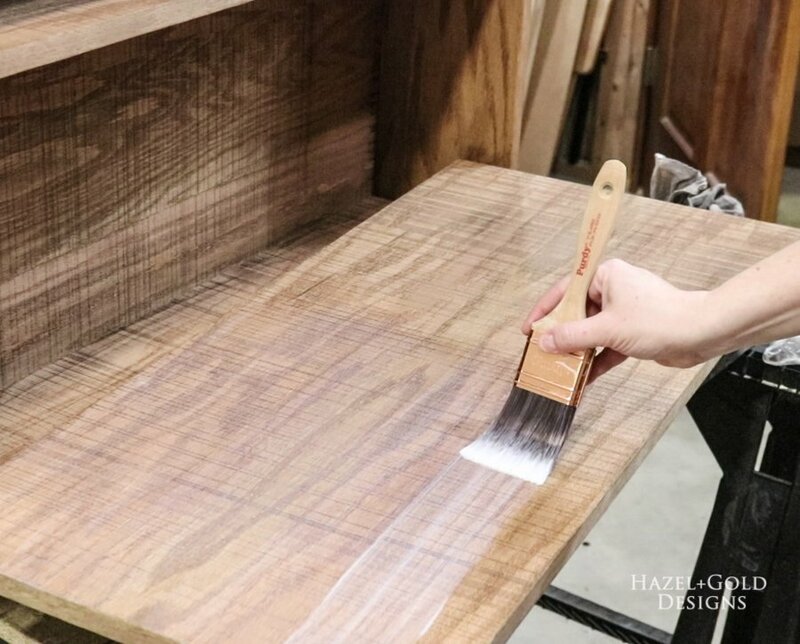 Use whatever method you prefer to stain your cabinet. 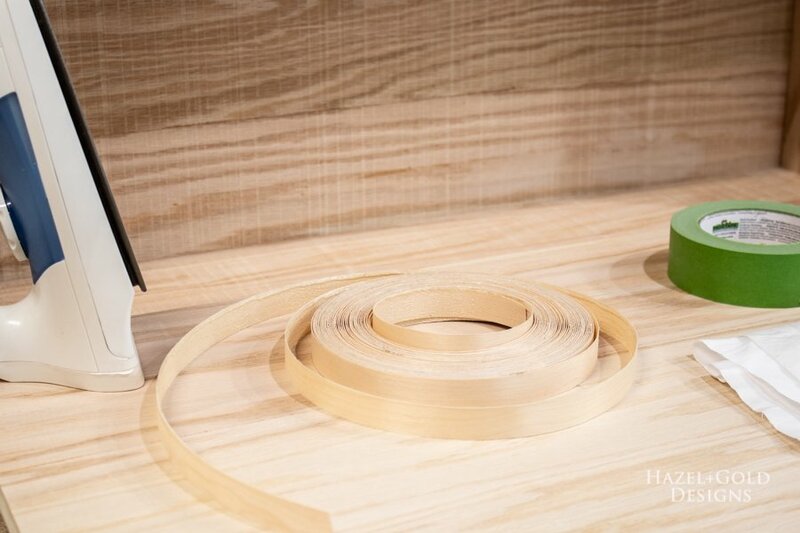 Look at how it brings out the gorgeous texture of the PureBond® Rough Sawn Plywood. I’m in love! The edge banding stained beautifully as well. 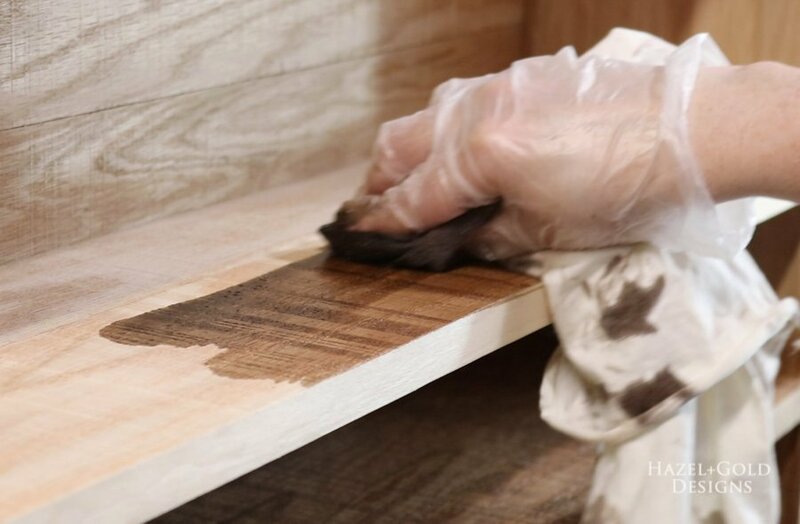 Don’t forget to cut and stain the cabinet door! Again, that texture must be noted and admired! 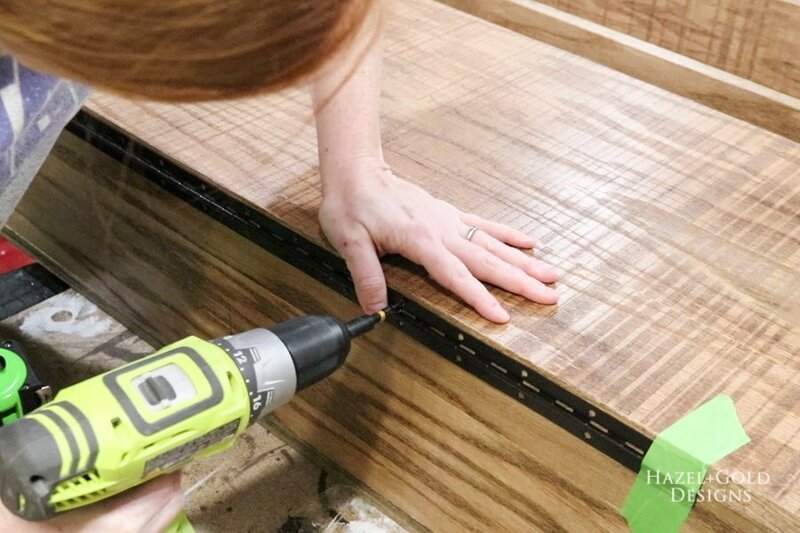 Once the stain has cured to the guidelines on your chosen can, add a few coats of polyurethane. 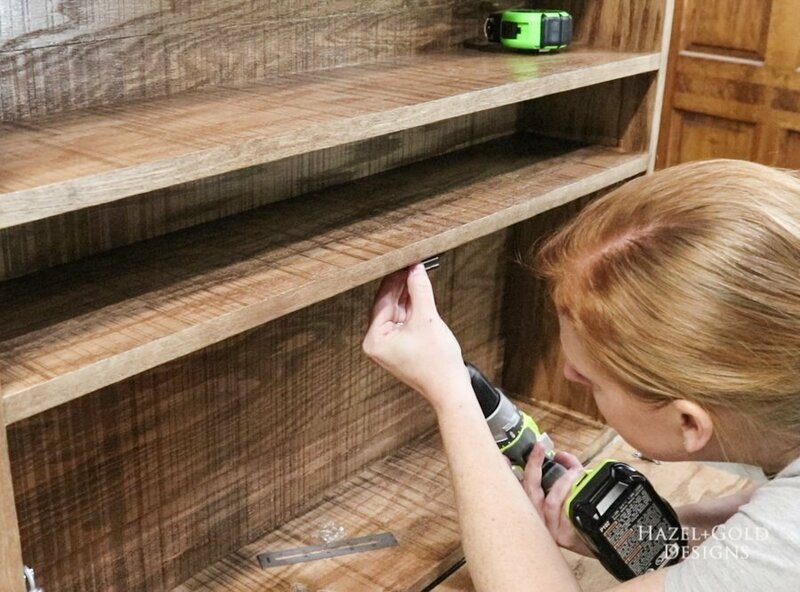 To be truthful, I only added two coats of polyurethane to the majority of the cabinet, but I did four coats on the shelves and inside of the door. I sanded in between the last two coats with 220-grit sandpaper then added the fourth coat. 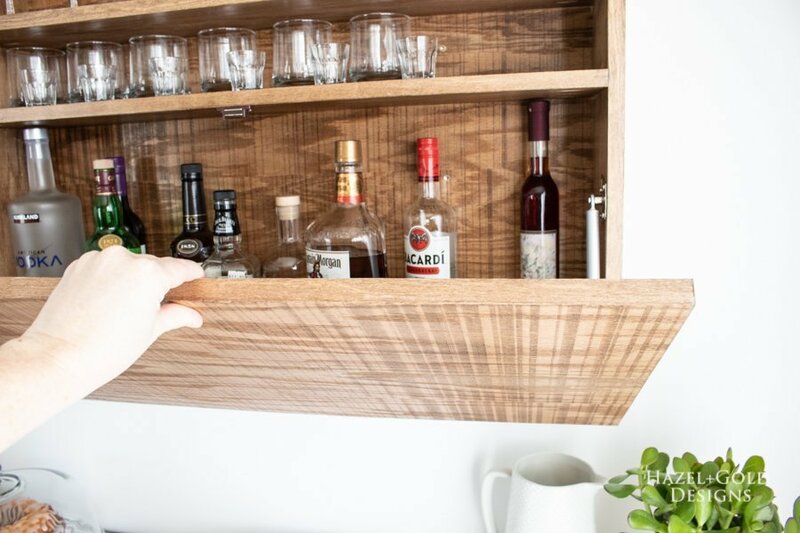 The inside of the door will become your serving surface so it will receive the most abuse aside from the shelves. The first piece of hardware is the piano hinge. 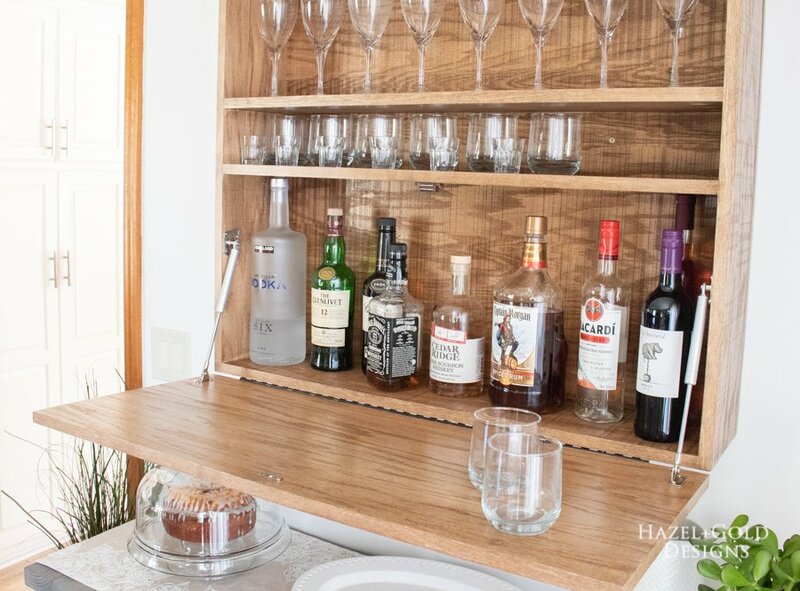 I wanted mine mostly hidden and wanted the cabinet door to completely cover the front of the cabinet flush on all edges, so I installed the piano hinge on the bottom of the cabinet. I used painter’s tape to keep the hinge in place and a few playing cards underneath the door to add a tiny amount of space to allow the hinge to move freely. Drill pilot holes in each hole of the hinge. 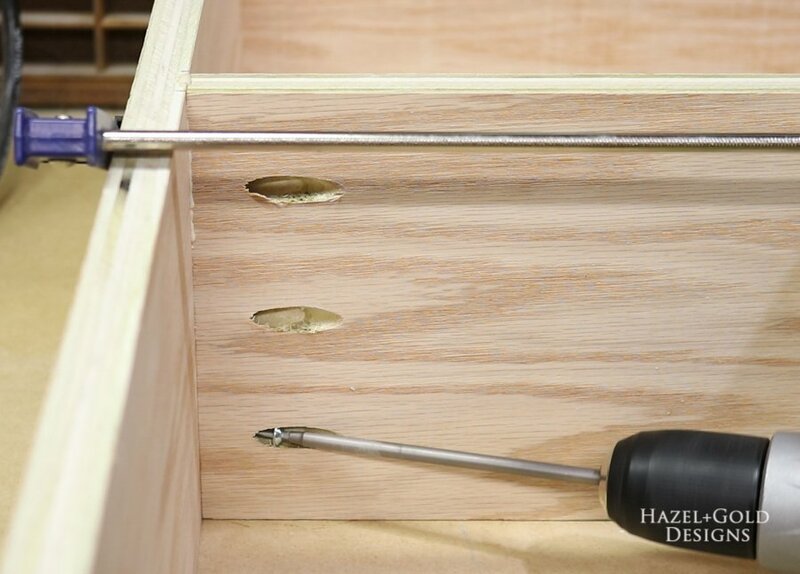 Use the included screws to attach the piano hinge to your cabinet. Next, install your pneumatic hinges according to manufacturer’s instructions. There are many kinds of hinges out there so be sure to check the weight and length guidelines before buying. I definitely needed two hinges since the cabinet door is quite heavy and large. And finally, add the magnetic catch. I installed mine on the bottom of the lower shelf and then measured to know where to install the metal plate on the door. They matched up perfectly. 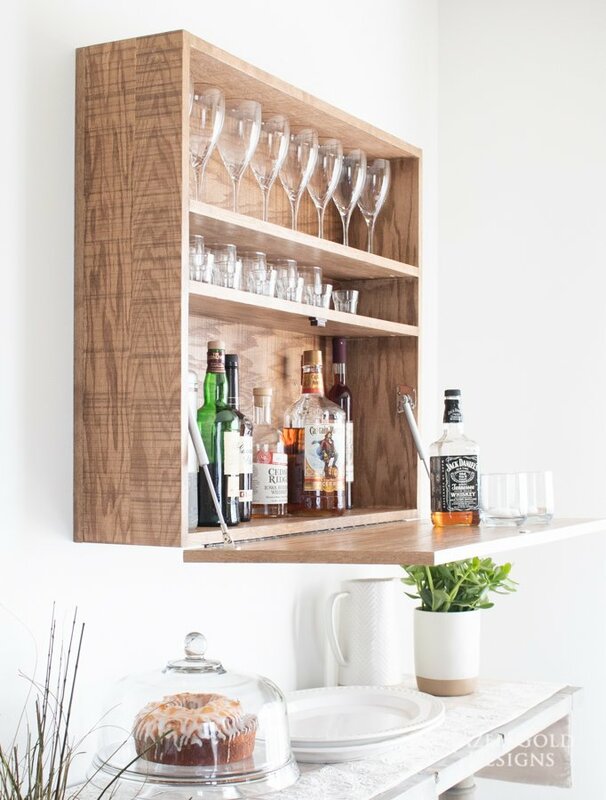 Now stand back and admire your amazing bar cabinet! 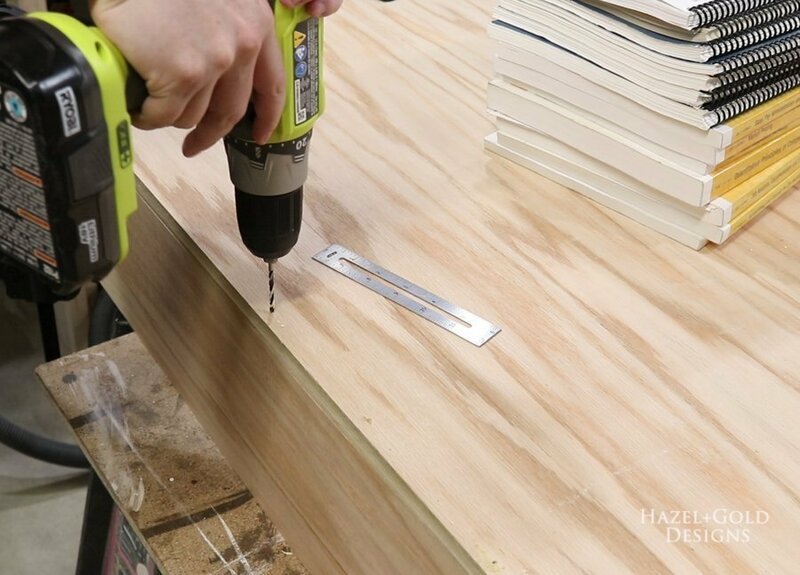 To install, mark the studs in your wall and where you want your cabinet. 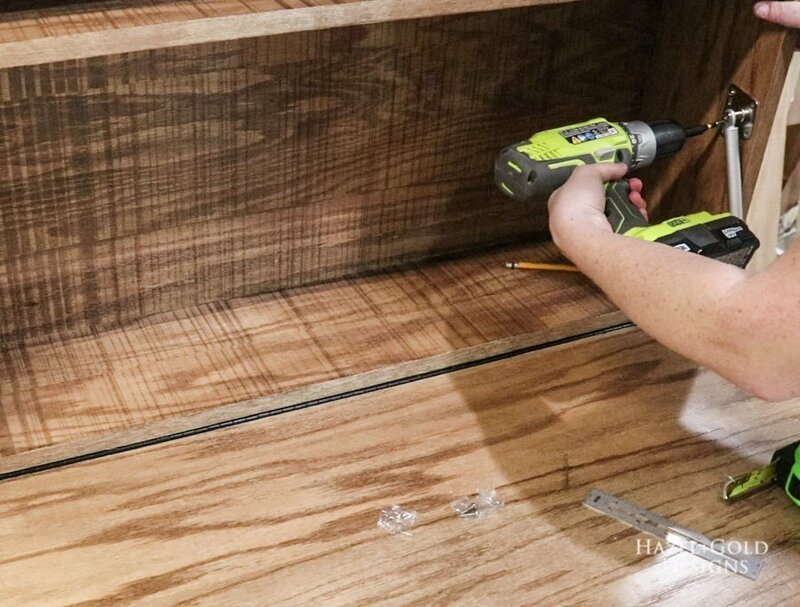 We propped ours up on a ladder and one person held the cabinet in place and level while the other person screwed 3″ wood screws through the back of the cabinet into the studs. We used eight screws to anchor this in place since it will hold a lot of weight. 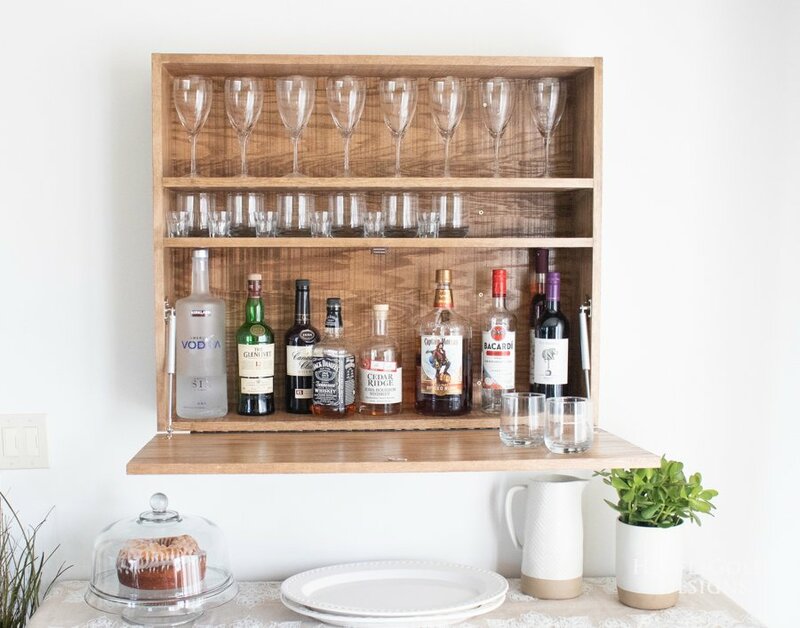 Finally, load your bottles and glasses into the cabinet. 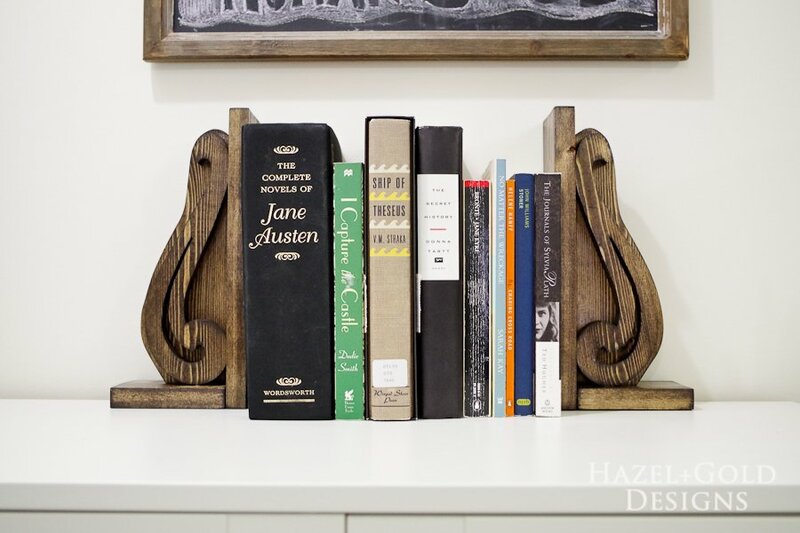 Isn’t that PureBond® Rough Sawn Plywood absolutely gorgeous? 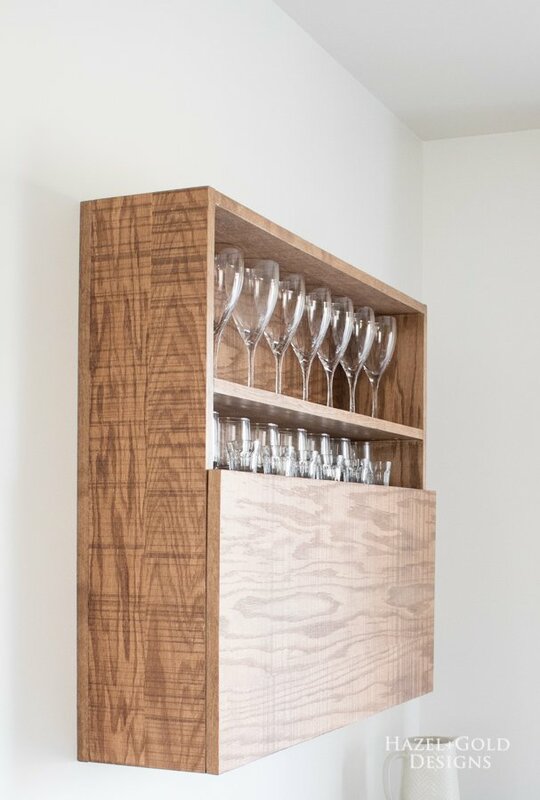 I love the texture and depth it gives to the cabinet. 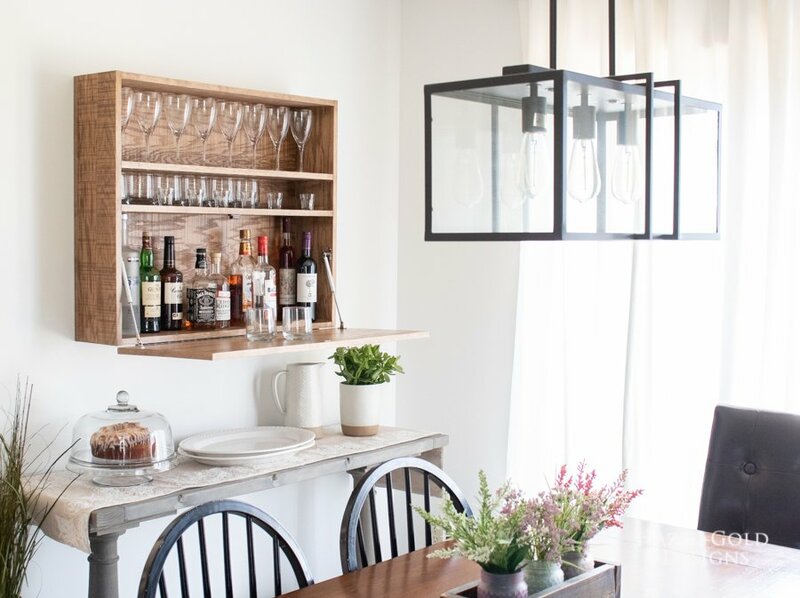 It’s still clean and modern looking with just a touch of rustic. I absolutely loved working with this plywood. 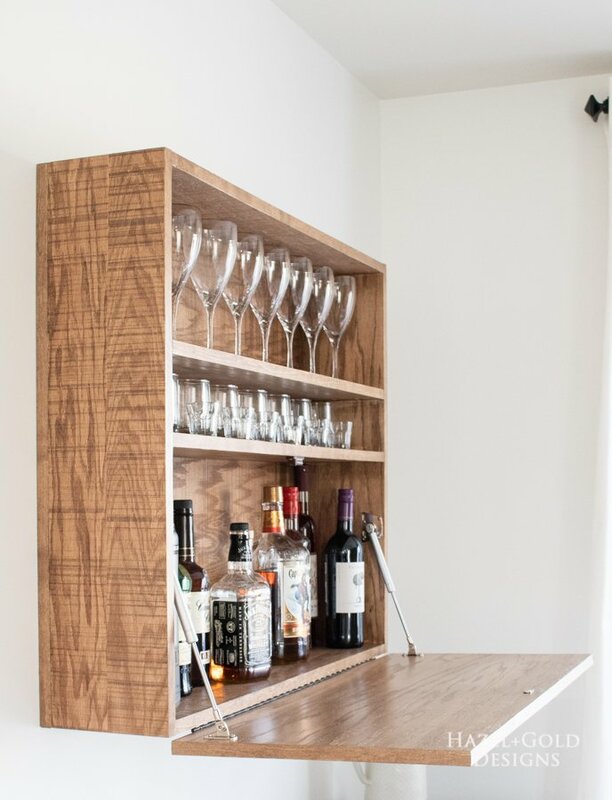 Time to have a drink and admire your beautiful new bar cabinet! What do you think? Would you change anything? 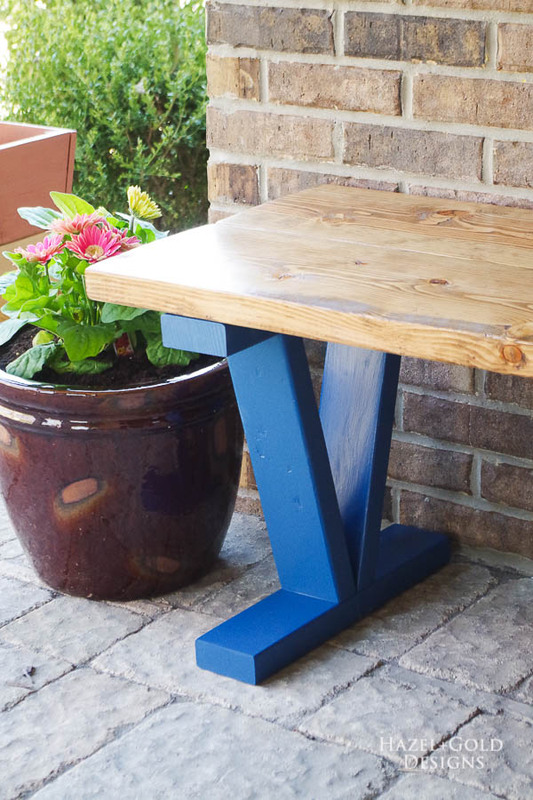 What do you think of PureBond®’s Rough Sawn Plywood? I absolutely love it for this project. Thanks so much for reading. I hope you found this tutorial helpful. Do not hesitate to ask questions in the comments if you’re wondering something. Get out there and build! I am in love with this project. 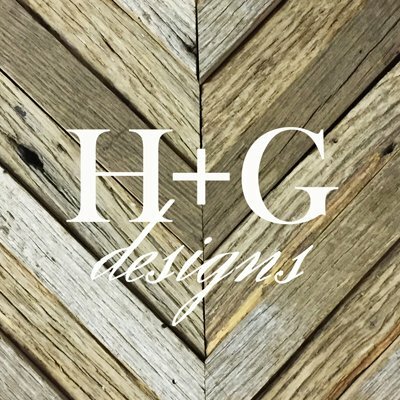 I just shared it with a friend who has a she shed and I want to make one for her. You did an amazing job! 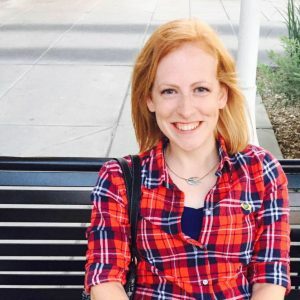 Thanks so much for sharing at AMAZE ME MONDAY! Nice job I really like it! Maybe it’s a project for this weekend. 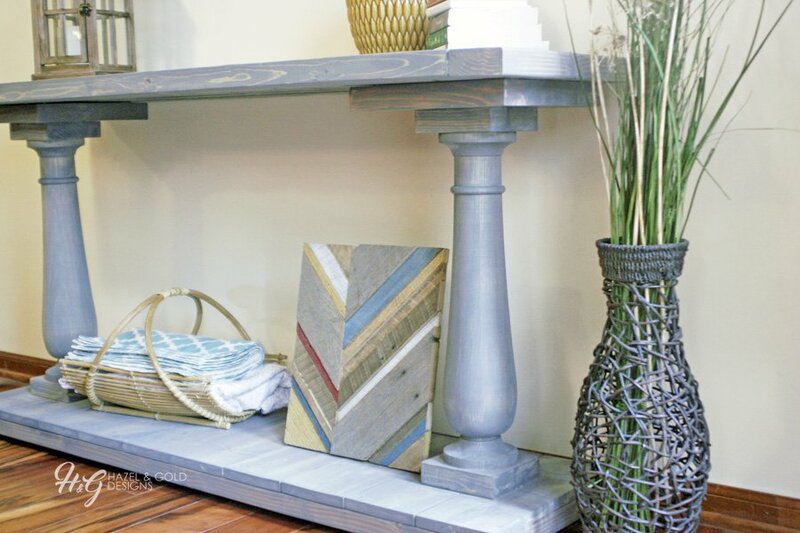 What a fabulous DIY project Sheri. The rough sawn plywood looks amazing. 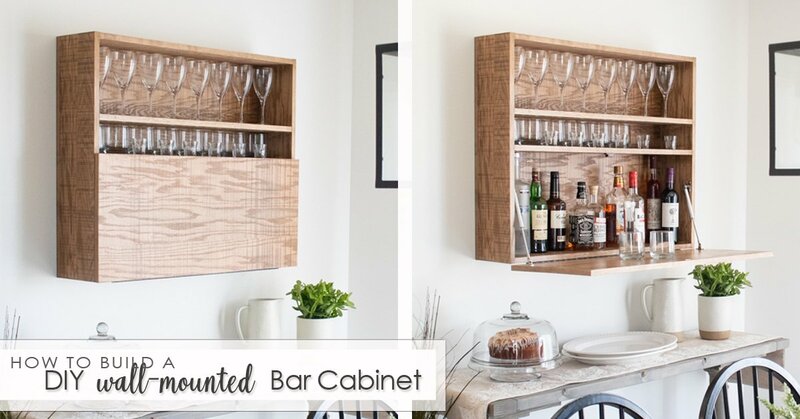 Thank you for linking up your wall mounted bar cabinet at Create, Bake, Grow & Gather this week. I’m delighted to be featuring this post at tomorrow’s party and pinning it too. This looks amazing! I also love that it is on the wall instead of on the floor. We had some wine glasses hanging closer to the floor, but had to remove them because my one-year-old liked to play with them. This could definitely solve that problem! It would solve that problem for sure! Plus you have a beautiful place to serve drinks. Thanks for your comment and support! It’s gorgeous! I’ve never seen a material like that before, and I love the finish! 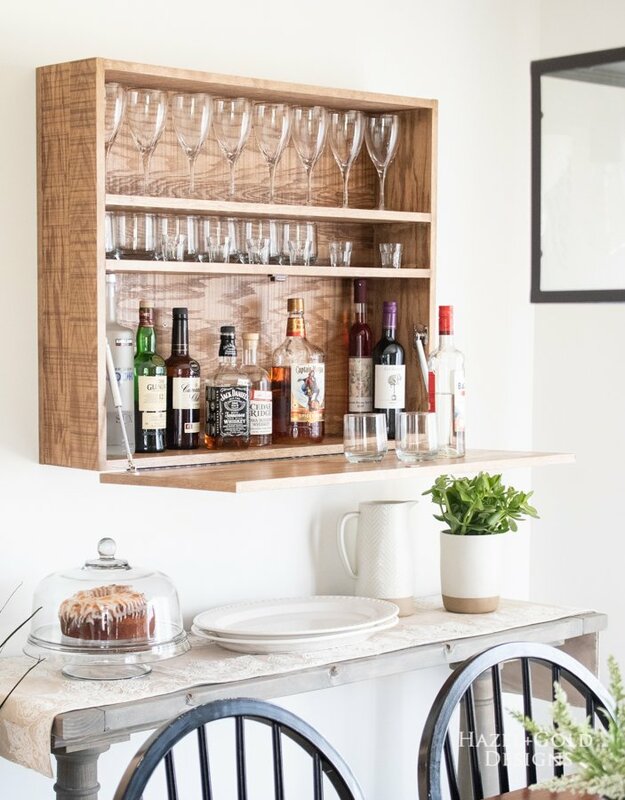 What a good use of space, too – so nice to have another surface to prepare drinks on. Thank you! 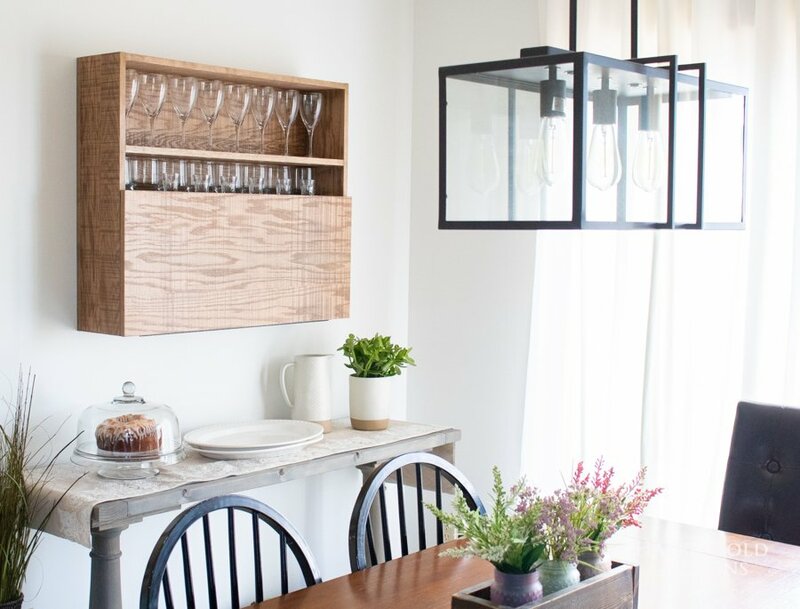 Yes, I am excited to have a place to serve drinks when we’re gathered in our living room (adjoining this dining room) or sitting down for games at the table. The rough sawn plywood is really impressive to me. I’m excited to use it more in the future.